Soft plush rare white dingo from Bocchetta. 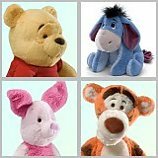 Soft lying plush from Bocchetta. Soft and plump with personality. 11" tall. From Sunny & Co. 14" long. A great toy or gift from Douglas. Soft plush from Russ Berrie. Ultra soft whiter plush from Douglas. 12" tall. Standing plush from Douglas in the perfect size for play! 6" long. Entirely realistic, overwhelming cute. 12" long. From Douglas. Large lying plush from Bocchetta. Long haired black & white plush. 8" long. Flowing mane and tail. From Douglas.